Traditional souvlaki (kalamaki): history & alfa-cert definitions - Certs-it ! For the Greeks, traditional souvlaki is much more than a type of fast food, as many foreigners tend to believe. Souvlaki is one of the main delicassies of Greek gastronomy. 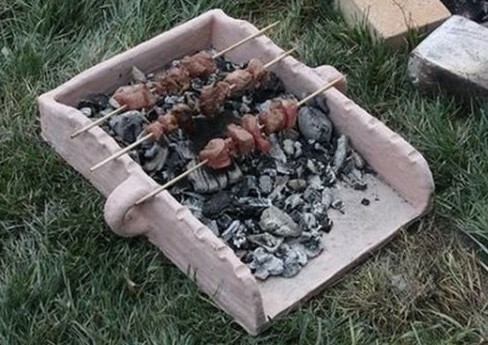 And the recipe of souvlaki comes from the ancient times. Souvlaki (in Greek “σουβλάκι“, plural souvlakia), is a popular Greek fast food. It consists of small pieces of meat grilled on a skewer. And it is eaten straight off the skewer and is usually well done. It can be served with pita bread, fried potatoes, lemon, and dips. The meat is usually pork, although chicken, beef, and lamb may also be used. The word souvlaki derives from the Greek word souvla (skewer), which probably derives from the Latin subulus or subula. “Souvlaki” is the common term in Macedonia and other regions of northern Greece. While in southern Greece and around Athens it is commonly known as “kalamaki” (reed). In both cases we mean the small pieces of meat that are grilled “en brochette” (on a skewer). Nevertheless, the word souvlaki is used also to describe a “kalamaki” wrapped with a “pita“, and with different vegetables or sauces added. A more correct name for this would be “tylichtó” (wrapped) or “souvlaki me pita” (souvlaki with pita). The words “tylichto” and “souvlaki me pita” are even used to describe a wrapped with “gyros” (instead of kalamaki). Those who insist on talking correctly, would use the word “pitógyro” for this. Souvlaki is one of the main delicacies of Greek gastronomy. 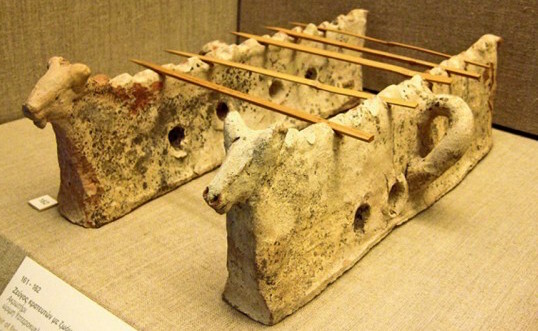 And the recipe of souvlaki comes from the ancient times. But souvlaki is not a recent discovery. It is a 4.000 years old baking art with a very long history. An archaeological finding from the excavations in Santorini is seen in the above picture. These are krateftés (grills) for souvlaki. They had cuts for the skewers and small holes for ventilation of charcoal. They were very ergonomic (transportable). And they offered a healthy baking, since fat is falling down. Achilles is mentioned in Homer’s Iliad to bake on charcoal small pieces of meat in skewer, and larger pieces (like today’s kontosouvli). Souvlaki was known in Ancient Greece with the name oveliskos (obelisk) from the word ovelos (οβελός =skewer). It is also mentioned from Aristophanes, Xenophon and Aristotle. A vary simple recipe; small pieces of meat in a skewer that was called davlós and a slice of bread, like today’s kalamaki with bread. The ancient Greek Hegesippus at his cooking guide titled Opsartyrikon mentions a dish called kándavlos consisting of grilled small pieces of meat with cheese, pita and dill. In Rome, on 1st century BC, they used to do skewers with giblets. And later in Constantinople, they used to sell souvlaki with pita in the streets. In modern Greece, souvlaki was re-enterd on 1924 by Isak Meraklidis, who came from Egypt, and opened the first “souvlatzidiko“. It was called “Egyptiakon” (Egyptian), and it is still operating in Nikea Pireaus. On 1951, in Livadia, they started selling kalamaki with a slice of bread. In the next decades the souvlaki evolved and became something like a national food of the Greeks. And tourists coming in Greece, will always try the unique taste of “Greek souvlaki“. 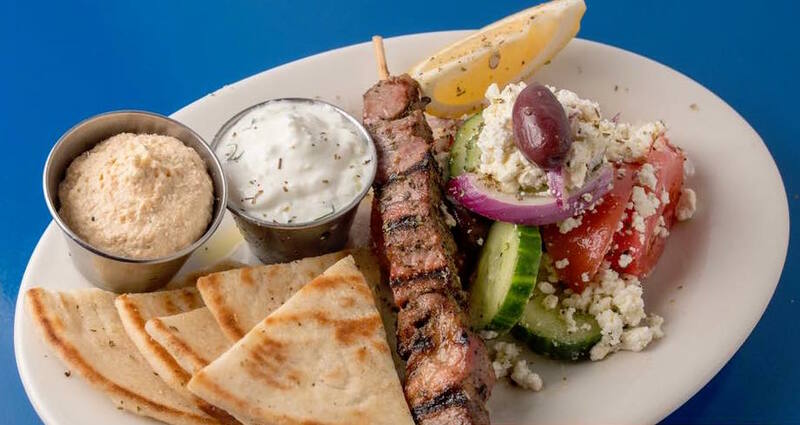 Souvlaki is a piece of our gastronomic history. It is registered as street food, but if served with vegetables it is considered a full meal! So, although souvlaki has a less than a century long history in modern Greece, we can still speak of traditional souvlaki. 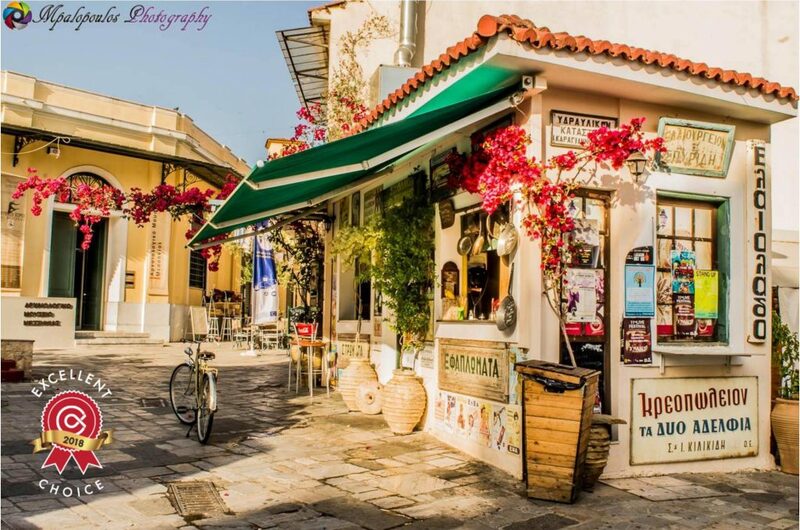 The souvlaki shop or restaurant is a grill house, with traditional Greek souvlaki cuisine and atmosphere. Traditional souvlaki is prepared with fresh meat of pork. A restaurant can also offer souvlaki from other types of meat (eg chicken, beef, lamb). As well as skewers that besides meat contain vegetables (eg tomato, pepper, onion). However, the baking and serving rules are the same as with pork souvlaki. Only fresh meat is allowed for use. The weight of traditional souvlaki is usually 80 or 125 grams. But there are no limitations for size and weight. Traditional souvlaki is grilled (only) on charcoal fire (not on heated plate or electric grill). Traditional souvlaki is always well done. The pita used in souvlaki me pita is also baked on charcoal, without the addition of oils or fats. Fried potatoes are always fresh cut; pre-fried are not allowed. Good quality olive oil is used in frying. Extra virgin olive oil is used in salads. Greek feta cheese is used in Greek salad. Feta substitutes (“white cheese”) are not allowed. If no feta is offered (feta is not produced in all areas), at least one good quality local cheese should be offered. “Greek salad” should include tomato, cucumber, onion, green pepper, olives, oregano anf feta cheese. It is always served fresh-cut and with extra virgin olive oil. It may also be enriched with local herbs (such as arugula, purslane, caper, caper leaves etc). The above are the specifications used by Alfa Cert for the certification of restaurants offering traditional souvlaki. And here is an example of an alfa-certified “souvlatzidiko“, one of the best in Greece, offering traditional Greek souvlaki.